Incorporated into the robust design and machined front and back bodies, internal (Non-latching) switching mechanism, internal pressure relief vent and a non-metallic inlet valve assembly. The Model 420-C Vacuum Regulator can be either direct ton cylinder mounted or installed on multiple cylinder pressure headers. The JCS Model 420-C operates as a pressure reducing valve to transfer gas under pressure to gas under vacuum within the chemical feed system. Installed between the cylinder/container of the chosen gas and the Chemical Feeder Model 4200, the Model 420 will switch from one cylinder/container to the next one in line as soon as the gas in the first cylinder is depleted. An internal switchover valve is automatically initialized in the event of gas supply failure; the reduction of the vacuum will isolate the regulator diaphragm cavity from pressurized pipe work. Incorporated into the robust design are machined front and back bodies, internal (Non-latching) switching mechanism, internal pressure relief vent and a non-metallic inlet valve assembly. The Model 420-T can be either direct ton cylinder mounted or installed on multiple cylinder pressure headers. The JCS Model 420-T operates as a pressure reducing valve to transfer gas under pressure to gas under vacuum within the chemical feed system. Installed between the ton container of the chosen gas and the Chemical Feeder Model 4200, the Model 420-T will switch from one ton container to the next one in line as soon as the gas in the first ton container is depleted. An internal switchover valve is automatically initialized in the event of gas supply failure; the reduction of the vacuum will isolate the regulator diaphragm cavity from pressurized pipe work. The JCS Industries Model 420-INJ Chemical Injector is designed to easily and safely deliver chemical into the water supply using an existing water line. The Model 420-INJ Chemical Injector operates using vacuum by utilizing the venturi effect, which is a byproduct of water flow though the system. The injector will only function when there is sufficient water pressure in the unit and will only function when the system is operating. 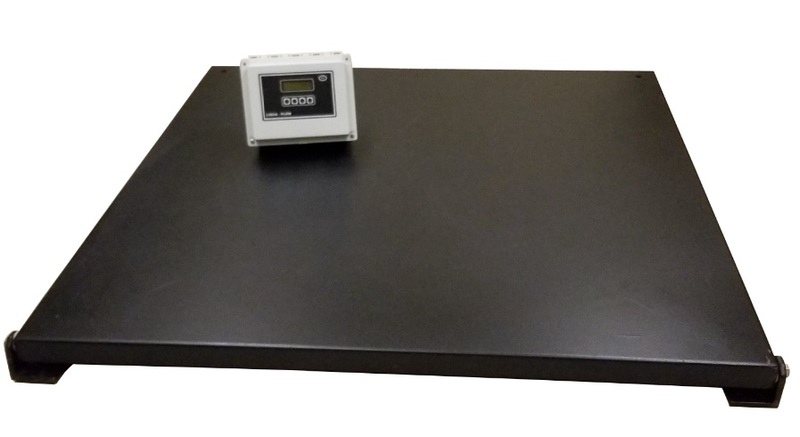 The JCS Industries Model 420 Remote/Mini-Remote Meter Panel is designed to safely deliver and meter gaseous chemical from the vacuum regulator to the injector. 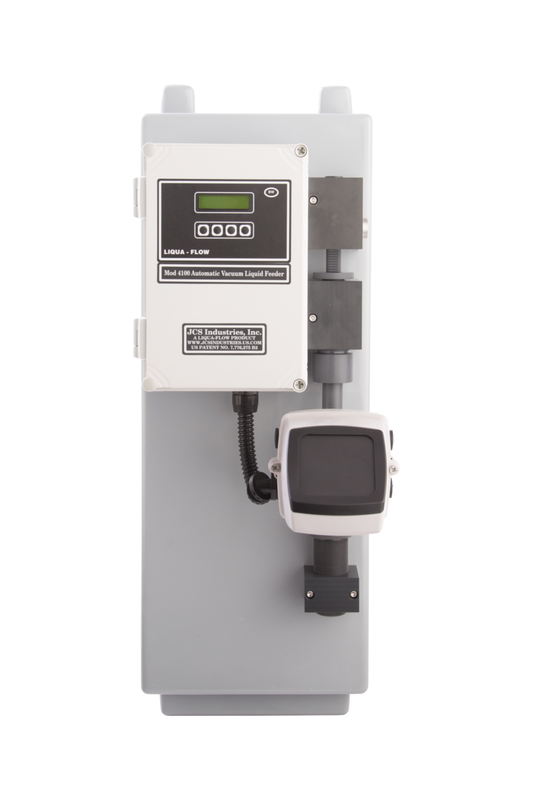 Both the remote meter and the mini-remote meter assemblies are designed to precisely deliver chemical over months at a time without service. 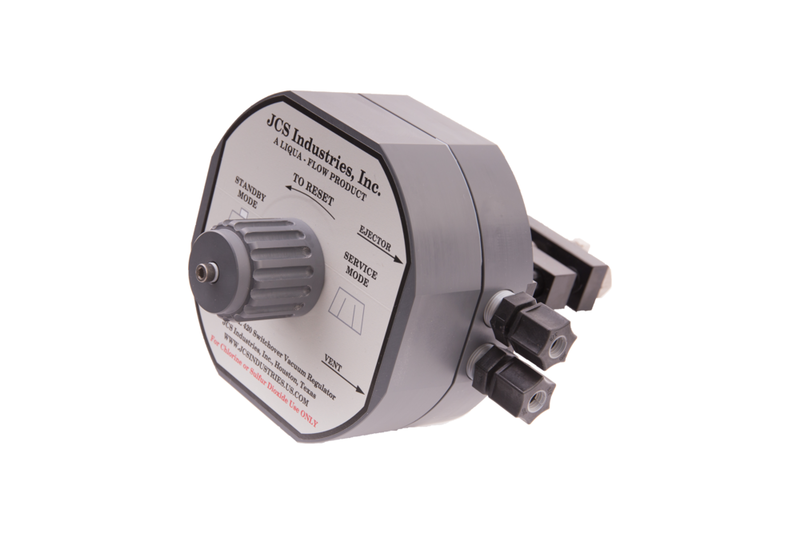 The JCS Industries Model 4120 Liquid Vacuum Switchover is a robust device that has been designed to aid in applications where impurities or fouling materials might cause a feed-water or primary vacuum source injector to clog or become inefficient. In such a case, the model 4120 automatically allows for a second, backup injector to take over the chemical feed process. The Model 4120 will, as soon as reduced flow is detected, instantly shut down the primary vacuum source or injector and switch flow to the secondary injector or vacuum source, thus allowing uninterrupted operations. The digital display of the Model 4120 provides the necessary alarms to switch from one vacuum source to another and, alert operations personnel that a catastrophic failure has occurred. The JCS Model 4120 can also be set up to operate in conjunction with external vacuum generating devices such as the JCS Model 4140 Chemical Induction System. The JCS Model 4130 Chemical Dilution System is a robust device that has been designed to aid in applications where the feeding of dilute chemicals is required by regulations or desired for optimal feed situations. The Model 4130 dilutes the specific chemical using a calculated all vacuum batch process in which a desired concentration and volume are entered into the Model 4130 controller. The operator reviews the selected parameters and presses start. All dilution water and chemicals are controlled and precisely metered throughout the dilution process. The JCS Industries Model 4140 Chemical Injection Mixer is a proven and reliable device that utilizes vacuum to safely and effectively induce both gaseous and aqueous chemicals into open channel water stream applications. The low (1750) rpm mixer coupled with the durable high energy nozzle, delivers a high degree of mixing efficiency. The robust design and high quality materials of construction wills stand up to any harsh environment application. The JCS Model 4150 Liquid Vacuum Polymer Feeder is designed for processes that require high efficiency, accuracy and reliability for feeding of most emulsion polymers. The system is comprised of a fixed rate vacuum injector to safely induce polymer into the dilution water stream, a control module, reversing servo motor, control v-notch and electronic flow sensor to regulate the polymer feed. The system pulls neat polymer from its storage tank, meters and controls the desired amount and activates the polymer as it mixes in the injector nozzle. The result is a highly activated and diluted polymer solution. With the Model 4150, there is no longer a need for high maintenance diaphragm metering pumps or proprietary mixing chambers. All mixing, activation and conveyance is performed in the solution piping. The system is comprised of a vacuum injector that safely introduces sodium hypochlorite, sodium chlorite, and hydrochloric acid simultaneously into the feed-water stream. The Model 4180 uses triple reversing servo motors coupled with v-notch valves to regulate the chemical feed rate, an electronic flow sensor for the sodium chlorite, sodium hypochlorite, and hydrochloric acid to generate a >95% ClO2 solution. The unique design allows for a continuous adjustment of all of the chemicals based off the actual chlorite feed rate to ensure accurate feed throughout the operator's desired range. Internal electronics allow for feed system to be remotely monitored and controlled from users SCADA. The JCS Model 4180 Chlorine Dioxide Generator will automatically regulate in both fixed and variable control modes. Compound Loop Control - External 4-20mA DC signals from both flow meter and residual analyzer are connected to the feeder. Chemical feed is controlled via the setup menu in the compound loop mode. Parameters such as sample lag, target residual and flow over-ride are entered in the Model 4200 Controller for responsive control. Compound Loop Control - External 4-20mA DC signals from both flow meter and residual analyzer are connected to the feeder. Chemical feed is controlled via the setup menu in the compound loop mode. Parameters such as sample lag, target residual and flow over-ride are entered in the Model 4200EC Controller for responsive control. 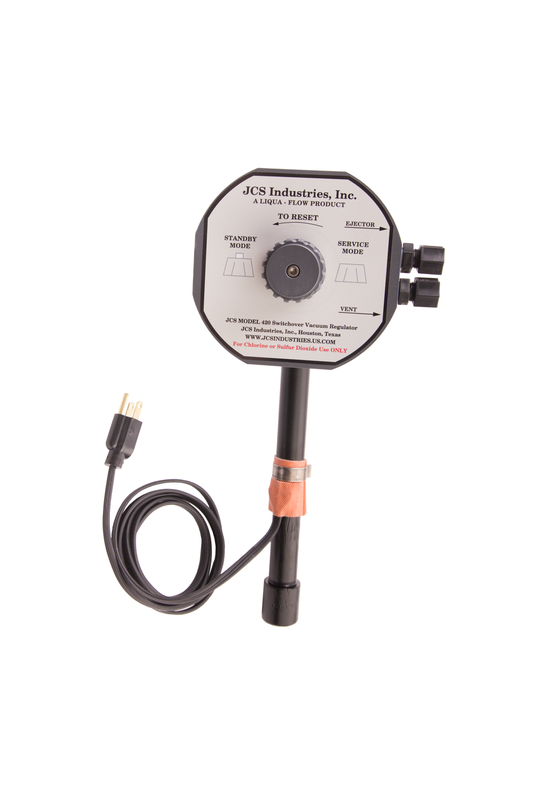 The JCS Industries Model 4400 Residual Chlorine Analyzer is an amperometric probe type analyzer that accurately measures both free and total chlorine in potable water. Its primary applications are in municipal and industrial water treatment applications. It can be used for waste water applications provided that proper filtering is installed in the sample feed line to condition the sample and to reduce suspended and dissolved solids. Digital electronics are incorporated into the controller to simplify operations. The controller provides a 32 character LCD back-lit display that permits operator configured engineering units via a simple four push button interface. The JCS Industries Model 4500 Gas Leak Detector/Monitor is a low cost, non-contact and easy to install measurement device designed for monitoring trace amounts of compressed gaseous water treatment chemicals such as, but not limited to: chlorine, sulfur dioxide and ammonia in a closed or open environment. This unit monitors toxic suspended molecules in the atmosphere. In a leaking scenario, the Model 4500 activates an alarm when gas levels exceed the programmed maximum rates. The monitoring sensors are compact and are designed for unobtrusive wall mounting in any convenient position. Installation, commissioning and maintenance are simplified by the modular design of the electronics. The Model 4500 can monitor up to two different gases simultaneously with each main controller. The JCS Industries Model 4600 Ultrasonic Level / Flow Monitor is designed to provide accurate and reliable level and flow rate measurements in the treatment process where harsh environments exist. 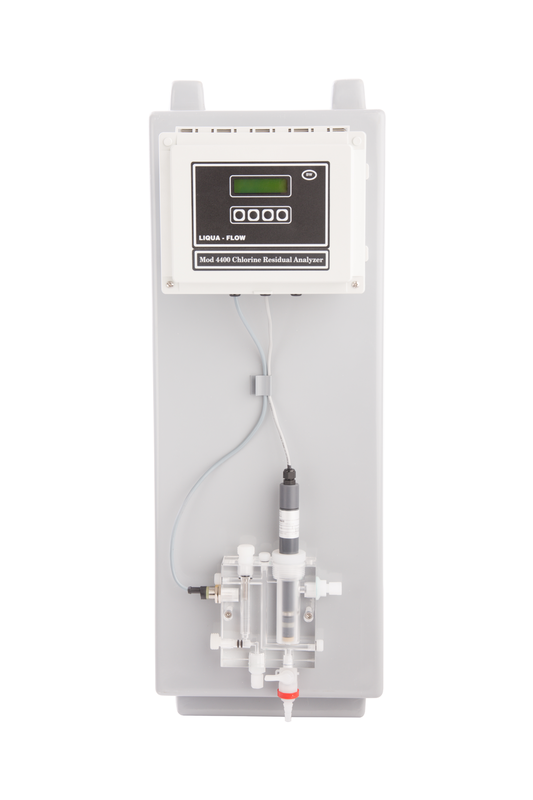 The Model 4600 can easily be configured for bulk chemical storage tanks providing a continuous level or volume readout, or in an open channel environment where a calculation can be entered to the monitor to display and totalize flow. The Model 4600 has internal data logging capability to aid in determination of trend and other important data to assist the user in process diagnostics. The Model RC is an actuator that REMOTELY CLOSES the valve on compressed gas cylinders such as chlorine, sulfur dioxide and ammonia cylinders and ton containers. The actuator is battery-operated with an electric motor that rotates the valve stem towards the closed position for alignment, tests and remote operation. The actuator is designed to mount without interfering with cylinder mounted hardware such as chlorinators, regulators etc. No yoke modifications or additional adapters are required. The motor, gears and controls are assembled as one unit. The Model RC-TVR is an actuator that REMOTELY CLOSES the valve on compressed gas containers such as chlorine and sulfur dioxide. The actuator is battery-operated with an electric motor that rotates the valve stem towards the closed position for alignment, tests and remote operation. The actuator is designed to mount without interfering with container mounted hardware such as chlorinators, regulators etc. No yoke modifications or additional adapters are required. The motor, gears and controls are assembled as one unit. The Model 2000C is an actuator system that can REMOTELY OPEN & CLOSE the valves on chlorine and sulfur dioxide ton containers. The system includes a battery operated actuator with an electric motor that rotates the valve stem towards the open or closed position for alignment, tests and remote operation. The actuator is designed to mount without interfering with or requiring yokes or additional adapters for dispensers or discharging hardware. The motor, gears and controls are assembled as one unit. The Model RPB001 is a mushroom push-button mounted in a polycarbonate enclosure. The package is designed to offer operators the ability to close all actuators at one time from a remote location. The enclosure switch is compatible with chlorine and sulfur dioxide containment areas. The twist to unlock normally-open switch is rated at 10 Amps at 230 VAC.